Manafort – who will receive credit for time served – must also pay $24m (£18m) in restitution and a $50,000 fine. The 69-year-old addressed the court on Thursday evening in Alexandria, Virginia, saying “the last two years have been the most difficult of my life”. “To say I am humiliated and ashamed would be a gross understatement,” he added, asking the judge to be “compassionate”. He described his life as “professionally and financially in shambles”. Judge TS Ellis said he was surprised that Manafort did not “express regret for engaging in wrongful conduct”. Nevertheless he said sentencing guidelines cited by prosecutors calling for between 19.5 and 24 years in prison were “excessive”. The formerly dapper lobbyist – who entered the court wearing a green prison jumpsuit and in a wheelchair – was impassive as he learned his fate. His legal team has previously said he suffers from debilitating foot pain resulting from gout as a result of his incarceration. 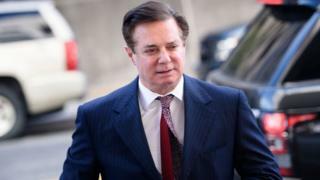 Manafort has been held in solitary confinement for the last nine months at a local jail since his bail was revoked for alleged witness-tampering. His sentencing marks a spectacular downfall for a high-rolling Republican political guru who advised four US presidents, including Mr Trump, and foreign leaders. What’s the background to the case? A jury in Alexandria, Virginia, convicted Manafort last August of five counts of tax fraud, two counts of bank fraud, and one count of failing to declare a foreign bank account. Manafort was indicted for hiding $55m in offshore bank accounts in Cyprus, money he was paid as a political consultant for pro-Russian Ukrainian politicians. Prosecutors say Manafort failed to pay more than $6m in taxes, as he funded his opulent lifestyle, including a $15,000 ostrich-skin jacket and a luxury renovation of his Hamptons mansion. Manafort served three months as Trump’s campaign chairman, from June to August 2016, before he was forced to resign amid scrutiny of his previous work in Ukraine. So was Manafort found guilty of collusion? No, Manafort has not been charged with anything related to the special counsel’s investigation into an alleged Russian plot to influence the 2016 US presidential election. Manafort’s lawyers had argued that the charges against him were outside the special counsel’s remit to investigate possible collusion with the Kremlin. However, Democrats point out that a Washington DC judge last month backed the special counsel’s contention that Manafort lied about his contacts with Konstantin Kilimnik, an aide alleged to have ties to Russian intelligence. In February, Manafort’s lawyers inadvertently revealed in a court filing that their client had shared polling data about the 2016 Trump campaign with Mr Kilimnik. The president’s critics also highlight that Manafort was present at a June 2016 Trump Tower meeting between campaign staff and a Kremlin-linked Russian lawyer promising “dirt” on then-Democratic presidential candidate Hillary Clinton. Manafort is due to be sentenced next Wednesday in another case brought by the special counsel, this time in Washington DC. He pleaded guilty in September to two felony counts – conspiracy against the United States and conspiracy to obstruct justice – related to his illegal lobbying. He also agreed to co-operate with the special counsel inquiry in a deal for a possible lighter sentence. He faces a statutory maximum of 10 years in District of Columbia case. Judge Amy Berman Jackson must decide if he if will serve his two sentences consecutively, or at the same time. President Trump, who frequently denounces the Mueller investigation, has not ruled out granting a presidential pardon to Manafort. What’s happening with the Mueller inquiry? The special counsel is expected soon to submit his report to US Attorney General William Barr. The political world is feverishly anticipating findings on whether the Trump campaign conspired with Russia, or if Mr Trump unlawfully sought to obstruct the inquiry. Mr Trump has denied collusion and obstruction and Russia has denied election interference. Five other Trump aides have been charged in connection with Mr Mueller’s investigation. Like Manafort, none have been indicted with criminally conspiring to subvert the 2016 election. Former campaign staff Rick Gates and George Papadopoulos, former US National Security Adviser Michael Flynn and former Trump personal lawyer Michael Cohen have all pleaded guilty. Longtime Trump adviser Roger Stone has pleaded not guilty.